Rain showers rinse the deck of Cutter Loose throughout the night. Morning brings overcast skies and cool temperatures. We dig out fleece and socks from the clothes locker. This is starting to feel more like Maine. The harbor entertainment continues this morning over a mug of hot tea in the cockpit of Cutter Loose as the windjammers prepare to get underway. As the skippers bark commands, the crew and the passengers hoist sail while the ship is still at anchor. A team of four able bodied seamen tackle the manual windlass on the foredeck in an effort to weigh anchor. They energetically push and pull the windlass handles, similar to gandy dancers on a railroad car. Eventually, the forward momentum of the ship breaks the anchor’s grip and the vessel sails smartly out of the harbor. 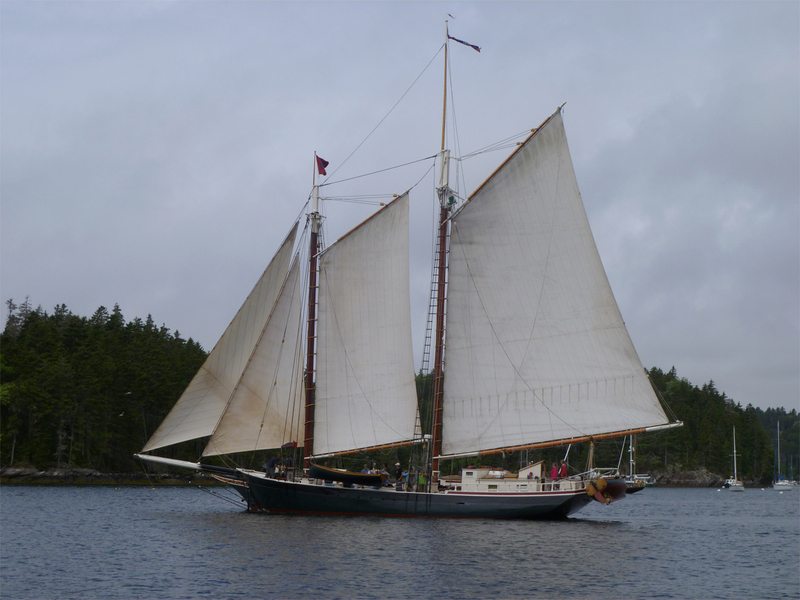 We steer Cutter Loose southeast through Eggemoggin Reach and into Jericho Bay. 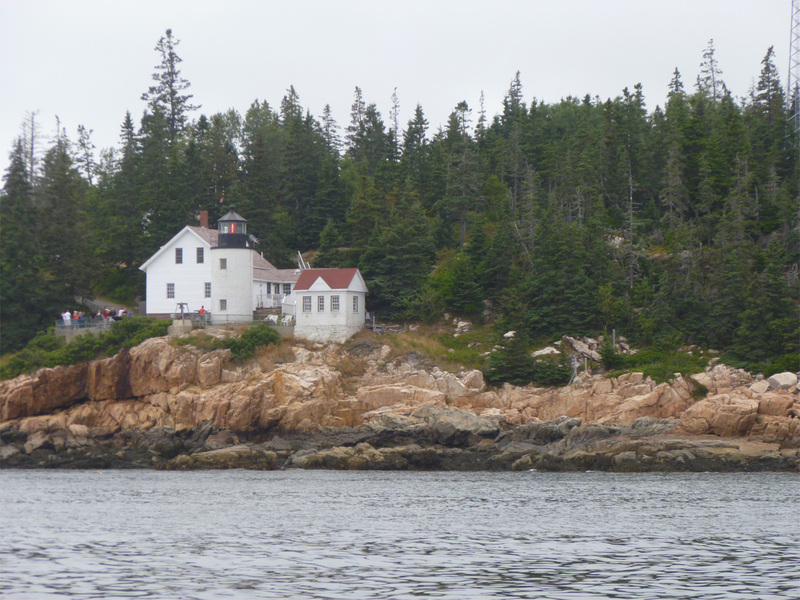 By 1:30 PM, we have transited the narrow channel through Casco Passage and enter Blue Hill Bay en route to Mount Desert Island. 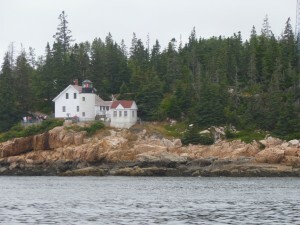 At the southern tip of the island, we glide past Bass Harbor Head as we leave Blue Hill Bay behind and enter Frenchman Bay. 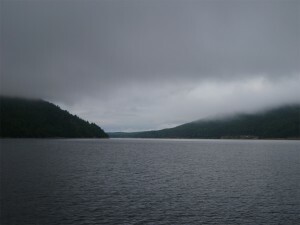 We pass the sailing centers of Northeast Harbor and Southwest Harbor, opting instead for the solitude of an overnight anchorage in Somes Sound. Somes Sound is a five mile fjord, the only one of its kind on the U.S. Atlantic coast. By 4 PM, Cutter Loose is at anchor in Valley Cove. We are surrounded by sheer rocky cliffs that fall hundreds of feet to the water. The water here is deep…too deep. Cutter Loose is anchored in 40 feet of water only 50 yards from shore. We are treated to a brief view of this incredible scenery before the anchorage is encased in a layer of fog. We will hope for clear weather in the morning so that we can fully capture this setting in a photograph. But the odds are not with us on this account. The weather radar shows a line of showers and thunderstorms on the leading edge of a cold front to our west. Rain is a certainty tonight. It may take the better part of tomorrow for this system to pass. After all, this is Downeast Maine.